New Delhi: The National Stock Exchange (NSE) partnered with The Garage, a San Francisco style start-up accelerator and co-working space in Mumbai, a business division of JetSynthesys, to host an exciting Machine Learning (M.L.) competition in India – NSE FutureTech 2018 Machine Learning Hackathon. This 30-hour live event held on March 17-18 challenged designers, coders and data scientists from across the country to tackle capital market challenges with machine learning. Partnering with NSE for the first time, The Garage provided a 170-seater venue and also made available WiFi and beverages for the Hackathon. 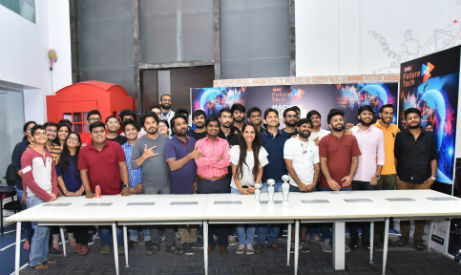 With pre-registrations of more than 400 developers, the event saw participation from more than 165 creative minds from technological and non-technological backgrounds who worked on real-life problems and attempted to develop a Machine Learning solution within a timeframe of 24-hours. A panel of distinguished judges including industry experts like Mr. Sankarson Banerjee, CTO, National Stock Exchange (NSE), Mr. Sumeet Vijaywargiya, Associate Director, IBM Watson and Mr. Karan Chaturvedi, Developer Advocate, IBM decided the winners’ basis their skill set and problem-solving ability. The criteria on which individuals and teams were judged was the solution, its technical simplicity, completeness and presentation. The top three winners of Hackathon received INR 1,00,000, INR. 50,000 and INR. 25,000 in cash, an opportunity to intern at ICICI, complimentary seating at The Garage, along with a bagful of goodies. The winners of NSE FutureTech 2018 Machine Learning Hackathon were The Matrix (Nikhil Lobo, Manish K., Subhnesh Kumar & Prashant), 1st Runner Ups Silicon Alpha (Sanket Shah & Priyank Shah) and 2nd Runner Ups Drupple (Swastik Shrivastava, Anirudh Murali, Rajat Rawat, Shivam Singh & Rohan Chougule).